In the battle against car parking in cycle lanes comes a new deterrent; the Barnacle works like a giant windscreen-mounted limpet that completely obscures a driver’s view to render the vehicle undriveable until a penalty is paid. The Barnacle has been designed to an improvement over ticketing and wheel clamps, which its designers consider cumbersome, archaic and inefficient. Effective parking enforcement and collection activities are a critical part of maintaining an efficient parking management solution – and as any urban cyclist will tell you, a vital of protecting cycle lanes from obstruction. 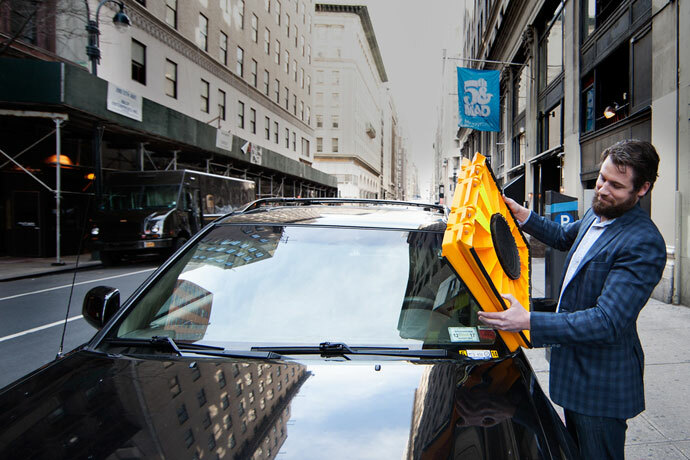 The Barnacle claims to offer advantages for enforcement agencies and drivers alike; wheel clamping is costly to administer and time-consuming for the driver left at the roadside waiting for their car to be released. The windscreen limpet design, by contrast, uses a ‘Pay and Remove’ system, which allows the motorist to pay over the phone and then use a code to quickly remove the lightweight device themselves. They then return it to a convenient drop-off location within 24 hours, in order to avoid a further penalty. How does the Barnacle work? Each Barnacle uses an integrated pump and large suction cups to produce over 100 kg of force, securely fastening it to the windscreen and ensuring it is almost impossible to remove without the release code or triggering the anti-tamper alarm. On the face of it, one cycle insurance policy is much like another, but the devil is the detail. How much excess you will be charged is just one of the things that varies wildly between providers. Another is so called ‘new-for-old’ replacement – many insurers use this term, but if your bicycle is more than a few years old, they devalue it severely. This means you are left out of pocket when you come to replace it. ETA cycle insurance has a low standard excess of 5% (minimum £25) and offers a new-for-old for life – however old the bike, if it’s stolen you get enough to buy a new model. For over 25 years we have been providing straightforward, affordable bicycle insurance. Whether you use your bike to commute, shop, race or amble in the park, ETA Cycle Insurance has you covered. We never devalue bikes no matter their age, allow you to buy your replacement bike wherever you like, replace stolen quick release components and handle claims in-house. The Good Shopping Guide voted us Britain’s most ethical insurance company 2016. A friend of mine who lived in London was often inconvenienced by illegal parkers, they even parked across his house access so he could either not leave his house or enter it. He suggested that such vehicles should be crushed. He thought if they returned and found their vehicle on the kerb the size of a biscuit tin it would stop them doing it again. The Barnacle is a nice idea but lots of selfish people would rather pay the fine and carry on illegal parking. That’s the world we now have. Or perhaps pay it then vandalise &/or dump the Barnacle? I agree with Jane Hanscomb, it’s a great idea in theory but imagine some ‘city spiv’ parks where she/he likes whilst earning a sqillion quid in the time they’re illegally parked the subsequent fines are nothing. They probably try and claim tax relief on it as a business expense!